Fast painting - gaming level miniatures! "Spray it white, base layer, ink it, two layers of highlights"
"Spray it black, drybrush it brighter and brighter until it looks decent"
"Spray white, base layers, then simply shade with thinned black"
I've got the pictures to show you the different results of these techniques for fast painting and you can see them all in my CMoN gallery. I have been happy with some of these results, particularly the first one. But I have found out that while it is a lot faster than painting display quality miniatures, it still isn't very fast. A miniature painted like this still took me at least 4 hours to paint, if it's a regular 28mm humanoid. So if I were to paint a regiment of 10 such miniatures, it would take me 40 hours and that is simply too much for anyone who wants to do anything besides painting (like actually playing with the miniatures). I have painted four bases of Snotlings during the past few weeks and it's been a golden opportunity to test out the different painting techniques for gaming level minis. The first base took me no less than 10 hours to complete! On the first one I used blending and shading and all kinds of slow techniques. The second one was better, but still took me about 5-6 hours. I the second one with black spray, and then drybrushed until my fingers (and my brushes) bled!. The drawback with this technique for me, is that the result is hurtful for my eyes. The coarse highlights I end up with is not something that I am proud of! I prefer to shade with thin paints, wash the mini and then highlight with thinned colours so that the highlights are smooth or at least semi-smooth. Drybrushing over black, for me, simply doesn't look good. Here is where the interesting part begins! On to the actual article! I will now describe the technique that works very well for me and very well lives up to the words fast technique. It's concentrated around washes which works very well for me because I like to shade my miniatures a lot, to use thin glaces, washes and deep shades to produce realistic minis. This is a really simple way to use more or less only washes to make gaming minis. Start by cleaning your miniature (duh..). Prime it white (very important). Then decide which is the dominant colour of your miniature. 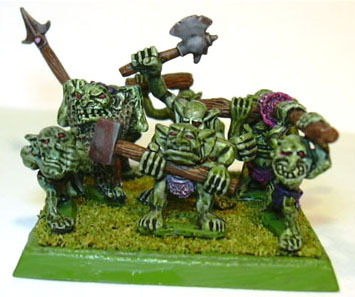 Since I will be doing a base of Snotlings, the dominant colour is of course green (goblin green!). Take this colour (goblin green), add a few drops of a brighter colour (camouflage green), then thin this with water and flow improver. I use "Winsor & Newton acrylics flow improver" together with water to avoid the shiny surface that thinning with only water leaves. For the first wash, you can use equal amounts of water, flow improver and paint. Mix it all and give the mini a quick wash with this. Don't bother to be neat when applying this first layer, because you will be fixing up all the details later. Your mini should now look something like this. It doesn't have to be Snotlings, this will work for any mini but it's easier to do the fewer colours you use. If you're painting a Rackham character with 2 billion details and 15 different colours, you'd probably be better off doing something else with it (but then again, confrontation armies are so small there is really no need for speed painting!). Looking good, eh!? Especially the snotling to the right looks particularly charming now, with his finger in his nose and his pink tongue sticking out. Please note that my choice of pink and purple clothings are of course optional (but indeed encouraged)! I love to paint funky colour schemes! "Muted earth tones rules" is not for me. I thinned these base layers a little bit, but not as much as the washes. Let the black wash we did earlier shine through a little, to give depth to the clubs and cloths and let the white undercoat shine through a little also, to provide a little bit of highlights here. One note here regarding the weapons: I've done this kind of tabletop minis before, using regular metallic colours. This time I wanted to try NMM, even though I did not spend a lot of time on it. It's just grey, shaded with the black wash. I added some red/brown (vallejo GC dark fleshtone) to the weapons before the black wash dried, to make it look like rust. I think it looks pretty good and I like this look a lot more than what quick metallics look like. I don't think it would work for shiny High Elves weapons, but it works for rusty Orkish style weapons! And thus ends this article and I hope you've learnt something and/or enjoyed reading this. Grammar and/or spelling mistakes are excused by declaring that I am neither American nor British (nor Canadian, nor Australian, etc etc..). I am Swedish and I hope my English is at least readable. Thanks for reading, and here's a shot of the finished Snotling Base to round off!